Documents for a project are grouped into versions, rather than being added directly to the project. For simple projects, it is typical to create a single version named 'master'. Other projects use workflows in which there is a version under active development, and one or more versions that are being maintained in a stable state with only some minor changes. Grouping these related versions under the same project allows for easier reuse of translations between versions. To add a version to your project, navigate to the project using the menu or user dashboard, go to Version tab, click on More action and select New Version. If your project has no versions yet, there will be a link under the project on the user dashboard to jump straight to version creation. Version creation button on a project homepage. Shortcut version creation link on user dashboard. The following screenshot shows the version creation page. 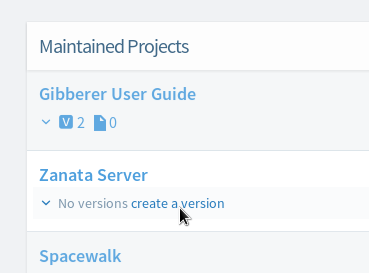 The settings in this screenshot will create a version under the 'zanata-server' project with ID 'master', that does not require a review phase for translations and will use the locales and validations from the project. See below for details on each option. This is the identifier used to refer to the version on the Zanata website and when using one of the Zanata clients. Versions do not use a separate display name. 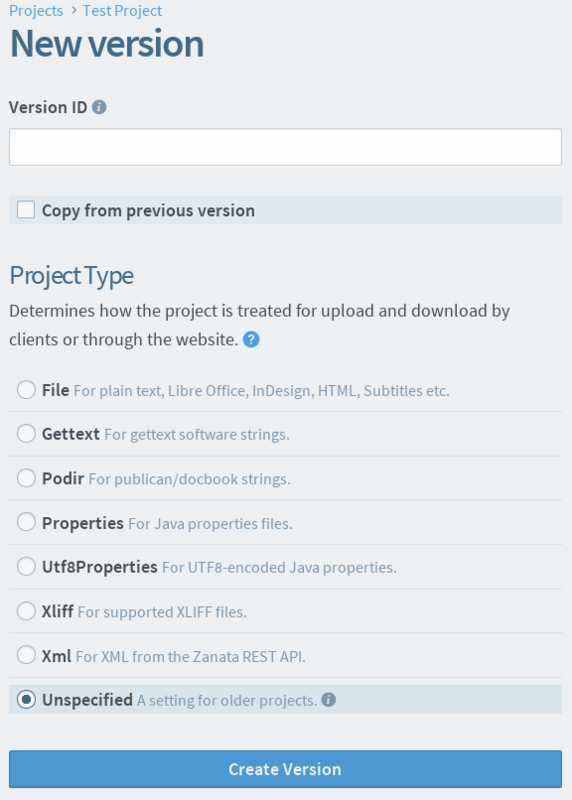 Project Type defines the type of files that your project uses to store source and translation strings. For more information see the Project Types. If selected, this new version is will based off the selected version. See Copy version for more information. Versions can also be created using the command-line client. See the help output of the client for a list of available options.